Automatic extraction of semantic information from text and links in Web pages is key to improving the quality of search results. However, the assessment of automatic semantic measures is limited by the coverage of user studies, which do not scale with the size, heterogeneity, and growth of the Web. Here we propose to leverage human-generated metadata—namely topical directories—to measure semantic relationships among massive numbers of pairs of Web pages or topics. The Open Directory Project classifies millions of URLs in a topical ontology, providing a rich source from which semantic relationships between Web pages can be derived. While semantic similarity measures based on taxonomies (trees) are well studied, the design of well-founded similarity measures for objects stored in the nodes of arbitrary ontologies (graphs) is an open problem. 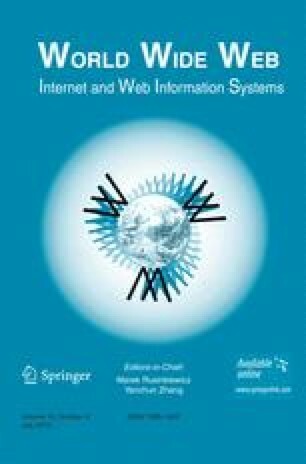 This paper defines an information-theoretic measure of semantic similarity that exploits both the hierarchical and non-hierarchical structure of an ontology. An experimental study shows that this measure improves significantly on the traditional taxonomy-based approach. This novel measure allows us to address the general question of how text and link analyses can be combined to derive measures of relevance that are in good agreement with semantic similarity. Surprisingly, the traditional use of text similarity turns out to be ineffective for relevance ranking.